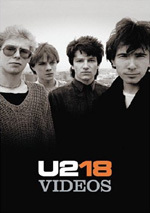 Few bands have enjoyed the commercial success of Irish rockers U2, and in this music video collection fans can access twenty-six years of groundbreaking music in one convenient and comprehensive package. With eighteen music videos spanning from the band's debut album Boy to their 2004 release How to Dismantle an Atomic Bomb, fans can watch firsthand as the band transforms from influential post-punk pioneers to arena-filling global superstars. Featured videos include "Window in the Skies," "Walk On," "Where the Streets Have No Name," "New Year's Day," "Vertigo," "I Still Haven't Found What I'm Looking For," and "Beautiful Day." In any case, I’ll run through the 18 videos and offer my reactions and ratings for each in the order they appear. Here goes! Beautiful Day provided the debut single and video from 2000’s All That You Can’t Leave Behind, but it didn’t give us the best from that album. Fairly simple, the video combines lip-synching within an airport environment. Toward the end, this becomes cool as we see U2 perform on a runway as jets scream over their heads, but otherwise the video comes across as average. A fairly good song, “Day” also isn’t among the best from Behind. 6 out of 10. The second single off of 1987’s breakout hit The Joshua Tree, I Still Haven’t Found What I’m Looking For provides a simpler video. Shot in Vegas, U2 wander Glitter Gulch while they lip-synch and interact with the folks. This is pretty typical mid-80s video fare, and perfectly watchable within those constraints. There’s not much to it beyond the sly conceit of staging a video for such a spiritual song in one of the world’s most decadent spots, but it’s entertaining. 6 out of 10. Going back a few years, we come to 1984’s Pride (In the Name of Love), the band’s ode to Dr. Martin Luther King Jr. and this DVD’s sole representative from The Unforgettable Fire. Even more basic than “Found”, this one concentrates mostly on a lip-synched rehearsal of the tune. However, it adds some symbolism via a ghostly audience and the Irish setting along with Bono in full rock god mode before he actually had quite earned it. Despite – or perhaps because of – the simplicity, it works. 7 out of 10. The Joshua Tree reasserts itself with the album’s leadoff hit, With or Without You. Another low-key video, this one goes for moodiness and atmosphere. It focuses on a lip-synch performance but intersperses dramatic lighting and imagery. Those elements help make it evocative and fulfilling, even if Larry looks like he doesn’t want to be there. (Then again, Larry always looks like he hates being at these video shoots.) 8 out of 10. Another first single shows up next, as Vertigo represented the launch from 2004’s How to Dismantle an Atomic Bomb. This one’s all about movement – or the impression of such, given that the band never goes anywhere. Visual effects create the feeling of speed and swirling, elements that make sense for the tune. I think it should’ve been more colorful; the stark, sandy setting doesn’t work for me. Still, it’s a good video that suits the material. 7 out of 10. One of the DVD’s earliest tracks comes from 1983’s New Year’s Day. All about obvious symbolism, this one mixes an icy lip-synch session with war imagery. Not exactly subtle, the video’s most interesting for historical value. Heck, Bono didn’t even have the rock god chops he showed in “Pride” – or maybe he was just too cold to emote well. 5 out of 10. I’ve always loved Mysterious Ways as a song. Unfortunately, that video seems decent at best. The second release from Achtung, it features U2 in Morocco and also depicts locals and belly dancers. Bono lip-synchs and we see some funhouse mirror distortions of him. The song still works great, but the video seems ordinary and lacks anything to make it particularly winning. 5 out of 10. From mediocre to great, we move to Stuck In a Moment You Can’t Get Out Of (US Version), the second video from All You Can’t Leave Behind. Like “One”, this song enjoys more than one version, but this one seems like the best of the pair. Set at a football game, it includes a cameo from John Madden and packs scads of U2 inside jokes; for example, they play at the “Unforgettable Firedome”. Fun and amusing, it even offers Larry as a rabid fan. That’s worth the price of admission alone. 9 out of 10. Apparently the first video created for Stuck In a Moment You Can’t Get Out Of, the Kevin Godley-directed “International Version” aired mainly in Europe, while Americans got the football one. Basically it shows Bono as he repeatedly gets tossed from a moving van. I much prefer the American edition, but this one seems decent. 6 out of 10. Our final Joshua Tree track, Where the Streets Have No Name shows U2 in Beatle mode as they stage a rooftop shoot in LA. If anyone wants to argue that U2 bought into the concept of the band as egotistical self-styled rock rebels, this video is Exhibit “A”. If it just showed the lip-synch performance, that’d be fine. However, if comes with many shots of adoring fans, glowering cops who want to shut down the proceedings, and puffy narration from deejays. This is less a video and more a self-aggrandizing piece of propaganda. 2 out of 10. An odd bird, The Sweetest Thing first came to life as a Joshua Tree-era “B”-side. However, it finally became a single in its own right as part of the promotion behind 1998’s first greatest hits compilation, and that’s the period in which this video was made. It follows Bono – who looks spookily like Elvis Costello here - on a carriage ride with his sweetie as he uses a series of absurd and ever-escalating tactics to apologize to her. Quick, clever, colorful and creative, it’s a blast from start to finish. 10 out of 10. For the second of the two War tracks, we go to Sunday Bloody Sunday. Unlike “New Year’s Day”, this isn’t an actual video. Instead, it’s just the band’s famous Red Rocks performance of the tune. It’s nice to have this on DVD – still waiting for the full Red Rocks release! – but it’s not exactly a scintillating clip. 5 out of 10. 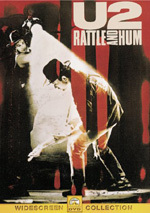 1988’s Rattle and Hum provides the next tune: Desire. More of a multi-media explosion than earlier U2 videos, this one mixes jerky lip-synch shots with video footage of cops, seedy LA street sights and other distractions. I’m not sure what point it wants to make, but it acts as a decent support for the tune. 6 out of 10. For the final All That You Can’t Leave Behind single, Walk On (International Version) comes from Brazil. We see lip-synch band shots interspersed with their daily business and shots of the area. It’s pretty pedestrian and forgettable. 4 out of 10. Inevitably, we also get Walk On (US Version). Ironically shot in London, this one shows a band performance mixed with the guys and others who morph into each other and deal with various travails. I suppose there’s a “we’re all the same” message in there somewhere, but it doesn’t go much of anywhere. At least this one’s more ambitious than the international “Walk”. Elevation finishes the All That You Can’t Leave Behind numbers. Created to promote the Tomb Raider movie, this one puts the Edge in the flick’s action but mostly stands on its own with fresh shots. It turns into a fun, inventive piece that’s miles ahead of most music videos for soundtrack tunes. 9 out of 10. Another Atomic Bomb track, Sometimes You Can’t Make It On Your Own starts well but soon becomes conventional. During the clip’s first few moments, Bono strolls the streets of Dublin and croons the tune live and a capella. Unfortunately, it then merges into the studio version of the song and comes with predictable visuals. If the video stayed with the initial concept, it would’ve been moving and memorable, even if it did rip-off Bruce’s “Streets of Philadelphia”. As it stands, the clip doesn’t stands out from the crowd. 6 out of 10. 18 Videos concludes with the package’s sole new number: a remake of the Skids’ The Saints Are Coming done with Green Day. Performed live at the Superdome to welcome home the New Orleans Saints, this shows the gameday blast. That makes it a nice historical piece and an interesting bit of music. 7 out of 10. By the way, if you’re adding at home, you’ll notice that “Saints” acts as the 19th video on 18 Videos. I guess they agreed with me when I said it wasn’t a real video. Why not just include it in the extras, though? And why not put the two alternate versions of videos in the extras as well and use the main program for clips that don’t appear here at all? Maybe someday U2 fans will have a complete catalog of their music videos, and if you combine 18 Videos with Best of 1990-2000, we’re pretty close. Some clips still remain absent, but we’re getting there. 18 Videos doesn’t substitute for a full package of promos, but it offers a lot of good stuff. U2: 18 Videos appears in an aspect ratio of 1.33:1 on this single-sided, double-layered DVD; due to those dimensions, the image has not been enhanced for 16X9 televisions. Actually, aspect ratios varied. While most of the videos went fullscreen, three of them – “Vertigo”, “Sometimes You Can’t Make It On Your Own” and “Stuck In a Moment You Can’t Get Out Of” (US) – looked to be 1.78:1. In addition, “Stuck” (International) looked to be a little narrower – maybe 1.85:1 - and “Elevation” went with 2.35:1 to match the Tomb Raider clips. As one might expect, the quality of the videos varied but appeared acceptable for the most part. This could be pretty up and down; some clips offered strong definition while others tended to be fairly fuzzy. Usually the videos demonstrated fairly positive clarity, though. Source issues weren’t a substantial concern. Some of the videos looked rather grainy, and a few specks marred earlier clips. Otherwise the flaws mostly fell into the “intentional” camp, as they existed due to filmmaker intent. Other elements also varied. Colors ranged from somewhat flat and muddy to reasonably lively and distinctive. The hues generally seemed acceptable, but they occasionally came across as a bit thick. Black levels also were somewhat bland but generally acceptable, and shadow detail varied from fairly concise to somewhat dense and opaque. None of these issues surprised me. I’ve seen enough compilations of music videos from the Eighties and early Nineties to know that they usually look hazy, murky and indistinct. For the most part, the U2 videos from that era followed what I expected. As one might anticipate, the newer videos looked best, and most of the clips from the last decade presented pretty solid visuals. Although the pieces rarely looked great, they seemed to accurately represent the source material. The PCM stereo soundtrack of 18 Videos provided a positive sonic experience. Stereo imaging seemed solid most of the time. Of course, those elements depended on the original tracks, but for the most part, the instrumentation and vocals appeared neatly delineated and easy to distinguish within the mix. It all spread across the front well and seemed to aptly reproduce the source material. The only notable exception came from “Sunday Bloody Sunday”, which sounded pretty one-channel; I didn’t notice any stereo imaging for it. Audio quality also seemed fine. Vocals sounded clean and distinct, though again, the original production affected this. The various instruments sounded clear and nicely defined, and bass response came across as appropriately deep and tight. Overall, the audio of 18 Videos more than adequately replicated the music. A mix of extras fill out the package. Two featurettes come first. The Making of “Vertigo” lasts 16 minutes, 29 seconds and includes comments from the Edge, Adam Clayton, Larry Mullen, Bono, directors Alex and Martin, and a French visual effects supervisor whose name I couldn’t understand. We get thoughts about the video shoot as well as notes related to the Atomic Bomb album and the then-upcoming 2005 tour. It’s not a tremendously informative piece, especially since the band comments tend to be self-aggrandizing, but we get enough info along with interesting shots from the set to make this useful. Next we get the 14-minute and 51-second A Story of “One”. We learn of how the song aided the band’s reinvention and then go through the creation of the three different videos. We also learn why various clips didn’t make the cut. Comments appear from directors Mark Pellington and Phil Joanou as well as the Edge. The program nicely covers the whole process behind the making of the three videos, and it offers some interesting behind the scenes footage as well. The DVD concludes with seven alternate videos. As with the main package, I’ll go through them in order and offer my comments and number ratings. Beautiful Day (EZE Version): This one mostly features shots of the band in the studio, though it also tosses in some beach vacation shots. If it looks cheap and unimaginative, that’s because it is. I don’t know why they even bothered to make this dull video. 2/10. Pride (In the Name of Love) (Slane Castle Version): Another cheap ‘n’ easy video, this one shows U2 at work on the tune in their Slane Castle “studio”. It’s not really any better than the “EZE” take on “Day”, but I like it a little more. 3/10. Vertigo (Lisbon Version): While the video itself is boring, the mix of the tune makes things more interesting. The video just shows the band while they wander around Lisbon and other spots. Despite some funky photography, there’s nothing interesting to see here. However, we get a dance remix of “Vertigo”. It’s not especially good, but at least it makes the video useful for collectors. 4/10. 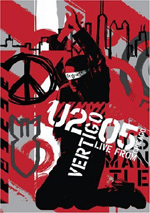 Vertigo (HQ Version): Also included on the bonus DVD with some versions of Atomic Bomb, “HQ” goes for a simple interior, single-setting lip-synch clip. It’s nothing revolutionary but it boasts some energy and works fine for what it is. I wouldn’t call it good, but at least it’s more fun to watch than its immediate predecessors. 5/10. 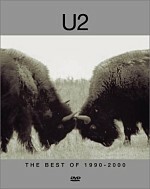 One (Buffalo Version): Oddly left off of the Best of 1990-2000, the second “One” may be the most evocative. It mixes shots of running buffalo intermixed with flowers and the word “one” in different languages. Yeah, that doesn’t sound like much, but it coalesces in a satisfying manner that suits the song. I like the first version best but think this one’s oddly compelling. 7/10. One Restaurant Version): This clip offers the third of the three versions. Directed by Phil Joanou, it seems pretty simple, as it mostly just shows Bono as he lip-synchs at a bar table and smokes. It also includes some live clips from the then-nascent Zoo TV tour. (Not “Outside” yet, it started in arenas in the late winter of 1992; that’d be the last time would play venues smaller than stadiums for nine years.) The video doesn’t do anything special, but it fits the song acceptably well. 5 out of 10. Sometimes You Can’t Make It On Your Own (Single Take Version): When I griped about the “regular” video for “Sometimes”, this is what I wanted. It gives us the promised single take of Bono as he strolls the streets and sings live. Unfortunately, it layers in the finished track as well, so Bono sings a duet with himself; it’d have been better with just his live vocals. Still, it’s much better than the released video. 8 out of 10. 18 Videos comes as U2’s second DVD of music videos, and it doesn’t prove as satisfying as its predecessor. Best of 1990-2000 includes more material and higher quality videos overall, though it omits many of the band’s best known tracks. That makes 18 Videos essentially a companion piece to 1990-2000, and it’s a good one, though fans will likely be irritated by the fact it repeats some videos from the earlier set. The DVD presents perfectly acceptable picture and audio along with a few interesting extras. If you only want one DVD of U2 videos, go with Best of 1990-2000, but I like this set as well and think it acts as a good complement.